What Are Causes and Risk Factors for a Shoulder Dislocation? What Are Shoulder Dislocation Symptoms and Signs? When Should Someone Seek Medical Care for a Dislocated Shoulder? What Specialists Treat a Shoulder Dislocation? What Exams and Tests Do Specialists Use to Diagnose a Shoulder Dislocation? Are There Home Remedies for a Shoulder Dislocation? What Is the Medical Treatment for a Shoulder Dislocation? How Common Are Recurrent Shoulder Dislocations? When Should Patients Follow Up With a Physician After Treatment of a Dislocated Shoulder? What Is the Recovery Time for a Shoulder Dislocation? Is It Possible to Prevent a Shoulder Dislocation? What Is the Prognosis for a Dislocated Shoulder? 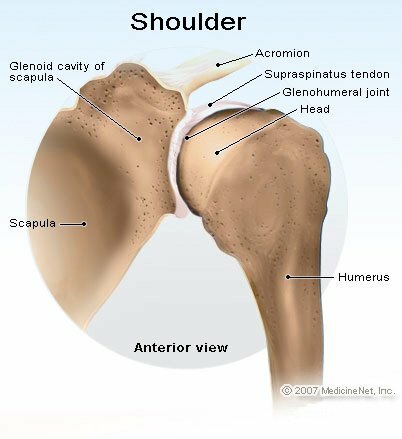 Most shoulder dislocations happen at the lower front of the shoulder, because of the particular anatomy of the shoulder joint. The bones of the shoulder are the socket of the shoulder blade (scapula) and the ball at the upper end of the arm bone (humerus). The socket on the shoulder blade is fairly shallow, but a lip or rim of cartilage makes it deeper. The joint is supported on all sides by ligaments called the joint capsule, and the whole thing is covered by the rotator cuff. The rotator cuff is made up of four tendons attached to muscles that start on the scapula and end on the upper humerus. They reinforce the shoulder joint from above, in front, and in back, which makes the weakest point in the rotator cuff in the lower front. Posterior shoulder dislocations, in which the upper arm bone detaches and goes toward the back, are much less common (about 4% of all shoulder dislocations). The rarest type of shoulder dislocation is inferior glenohumeral dislocation (luxatio erecta humeri) and makes up just 1% of all shoulder dislocations. The main symptom of a shoulder dislocation is severe pain at the shoulder joint. If the shoulder is touched from the side, it feels mushy, as if the underlying bone is gone (usually the humeral head -- top of the arm bone -- is displaced below and toward the front) and there is often a physical deformity. The patient may feel like the shoulder is loose, and they may hear pops or clicks. Numbness, tingling, and weakness may occur in the affected upper arm. In an acute injury, there may be swelling or bruising of the area. Many doctors' offices are not equipped to care for a shoulder dislocation. You may want to call your doctor or healthcare provider's office to seek advice in this regard and ask which hospital is best for treatment. If you strongly suspect you or someone you know has a shoulder dislocation, seek emergency care. Waiting several hours before seeking treatment could result in unnecessary suffering and further damage to tendons, muscles, blood vessels, and nerves. You may initially consult your primary-care provider (PCP) such as a family practitioner, internist, or child's pediatrician for a shoulder dislocation, but as stated above, they may not be able to care for this type of injury and will likely refer you to a hospital or an orthopedist. If you dislocate your shoulder due to an acute injury, see an emergency medicine specialist in a hospital's emergency department. Most shoulder dislocations can be reduced in an emergency department. You will be referred to an orthopedist for follow-up and an orthopedic surgeon if surgery is needed. If you have recurrent shoulder dislocations or other chronic shoulder issues due to sports injuries, you may see a sports-medicine specialist. Once the shoulder is put back into place either by manipulation in a doctor's office or hospital, or it is surgically repaired, you may see a physical therapist for rehabilitation. After taking a history (time of injury, how it happened, prior serious health problems or injuries), the doctor may do a brief general exam followed by a more detailed exam of the injured shoulder in order to make a diagnosis of a shoulder dislocation. The deltoid muscle (the round muscle covering the shoulder joint) may appear to be flatter on the injured side when compared to the healthy side. Any movement of the arm may cause pain in the shoulder. A set of shoulder X-rays is usually standard in diagnosing a shoulder dislocation. They are used to determine the presence of a dislocation, and also to check for other injuries (such as a fracture of the upper humerus or tearing of the ligaments connecting the collarbone to the shoulder blade). If a sling is not available, rig one by tying a long piece of cloth in a circle (a bed sheet or towel may do nicely). A pillow placed between the arm and body may also help support the injured shoulder. Because an empty stomach is best during treatment, the patient should not eat more than ice chips before being examined by a doctor. A dislocated shoulder should not be put back into place at home; however, once it has been put back into place by a doctor, some home remedies can help ease pain and discomfort. Ice the shoulder several times a day. Use over-the-counter pain relievers (analgesics) such as aspirin, acetaminophen (Tylenol), or nonsteroidal anti-inflammatory medications (NSAIDs), such as ibuprofen (Motrin, Advil) or naproxen (Aleve). Treatment may include medications to lessen pain. After a dislocation is confirmed by X-ray, many people require medicine to lessen pain and help relax the surrounding muscles during the reduction procedure (relocating the joint to its healthy alignment). The patient may require a mild sedative as well to allow the body to relax. Most people can have their dislocated shoulder relocated in the emergency department, but a few difficult cases require a general anesthetic in an operating room. Many successful techniques for relocating a dislocated shoulder are available. A doctor may need to try more than one technique on the patient before a method is found that suits the particular dislocation. The technique may also vary if the dislocation is not the usual anterior type. After the patient's shoulder is back in place, they will be sent home in a sling or shoulder immobilizer (a sling-like device that attaches to the body to lessen movement at the shoulder joint). A prescription pain reliever is often needed to control pain. Once the pain and swelling have subsided, you may be prescribed physical therapy for rehabilitation. A physical therapist will instruct you on passive exercises you can do to strengthen the shoulder muscles and restore the shoulder's range of motion and mobility. After about six weeks, more vigorous strengthening may be recommended, including use of light weights or resistance bands. Swimming may also be prescribed. Follow your doctor's or physical therapist's instructions on what exercises to do and how much weight to use. Once a shoulder has been dislocated, it is more vulnerable to recurrent dislocations. In people under the age of 20, 50%-90% may experience a recurrence of their shoulder dislocation. After age 40, the chances of having a recurring shoulder dislocation drop to 5%-10%. If the shoulder dislocation becomes chronic, a brace or splint may be prescribed. In cases in which physical therapy and a brace do not help chronic shoulder dislocations, surgery may be needed to repair torn or stretched ligaments. The patient should see an orthopedic doctor for a follow-up examination within a few days. Pain relieving medications may be modified and the joint examined to see that relocation has been maintained. The doctor may reexamine for injury to structures damaged by the original trauma. 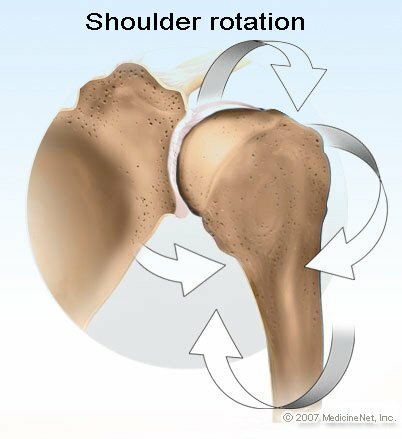 After a period of immobilization (usually a few weeks), slowly and gradually begin to increase the range of motion at the shoulder joint. This helps to preserve natural movement and lessen the risk of recurrent dislocation. When good progress is made with range of motion and mobility, strengthening exercises may be added to help the patient return to full function. Immobilization of the dislocated shoulder usually lasts about three weeks. If surgery is performed, this period of immobilization may last four to six weeks. This is followed by some range-of-motion exercises and isometric strengthening. After about 12 weeks, most people can return to participating in some sports on a limited basis. In most cases, the full recovery time for a shoulder dislocation is about 16 weeks, at which point a return to sports and other pre-injury activities should be possible. Prevention of a shoulder dislocation involves avoiding activities that can lead to injury of the shoulder. Avoid falls. If you participate in sports that involve the shoulder, make sure you strengthen and stretch the shoulder appropriately and wear protective gear when needed to protect the shoulder. If you have previously dislocated a shoulder, rehabilitation and exercise to strengthen the injured shoulder is the best way to prevent a recurrence. Good follow-up care leads to the best prognosis for preventing dislocation again and healing damaged tissues. Even with the best care, however, dislocation can reoccur. Most people who experience shoulder dislocations when younger than 20 years of age go on to experience a second dislocation. After age 40, a significant percentage have a second dislocation. If a dislocation occurs a second time in the same shoulder, especially with less trauma, the patient should be evaluated for the possibility of ligament damage in their shoulder. If this is the case, the patient may need surgery to prevent recurrent shoulder dislocations. American Academy of Orthopaedic Surgeons. "Chronic Shoulder Instability." December 2013. <http://orthoinfo.aaos.org/topic.cfm?topic=a00529>. American Academy of Orthopaedic Surgeons. "Dislocated Shoulder." October 2007. <http://orthoinfo.aaos.org/topic.cfm?topic=a00035>. Seade, L. Edward. "Shoulder Dislocation." Aug. 27, 2015. <http://emedicine.medscape.com/article/93323-overview>. Seade, L. Edward. "Shoulder Dislocation Treatment & Management." Aug. 27, 2015. <http://emedicine.medscape.com/article/93323-treatment#d12>. Sherman, Scott C. "Shoulder dislocation and reduction." Sept. 19, 2016.<https://www.uptodate.com/contents/shoulder-dislocation-and-reduction#H22>. What were the symptoms and signs of your shoulder dislocation? How did you dislocate your shoulder, and how was it treated? Please describe your experience. What treatment have you received for a dislocated shoulder? How long was your recovery from a dislocated shoulder?